Please read the following Terms and Conditions carefully prior to accepting services from the Blackrock Industrial Group. Any non-compliance with these Terms and Conditions may result in additional fees and expenses incurred to the customer unless addressed or otherwise agreed prior to the commencement of the project. Upon the issuance of an Initial Deposit or Purchase Order, the customer implicitly agrees to all the Terms and Conditions described below, unless otherwise addressed in the project’s Statement-of-Work. All bids are calculated with the assumption that the project will not be scheduled over a Federal or Religious holiday. Scheduling projects on such holidays will result in additional charges to the customer, which shall be addressed prior to the project’s commencement. All bids are calculated with the assumption that the project will be scheduled during regular working hours (6AM-8PM). All projects intentionally scheduled at night (8PM-6AM) by the customer will result in additional labor charges. If work continues into the night at the discretion or cause of Blackrock Industrial the customer will incur no additional costs. Blackrock Industrial Group will not mobilize crews or schedule a project unless a Purchase Order or Initial Deposit has been received via Electronic Wire Transfer, Check or Credit Card. Blackrock Industrial Corporation requires the receipt of any initial deposit a minimum of 10 days in advance of the project’s start-date in order to coordinate scheduling, labor, logistics and materials. Exceptions may apply. An additional 3.5% Convenience Fee will be applied for all Credit Card transactions. Any changes in scheduling requested by the customer must be requested at least 7 days prior to the projects scheduled start-date. It will be the customer’s responsibility to provide the following: Adequate Lighting for the project; a work environment above 55 degrees Fahrenheit and below 85 degrees Fahrenheit; 110-120 Volt Single Phase Electrical Power; 208-240 Volt Single Phase Electrical Power, or 480 Volt Three Phase Electrical Power; Dumpsters or dumping areas for disposal of debris and material; Sound construction of working facility. If the customer does not provide adequate power or lighting or if such amenities are not present in the working facility, Blackrock Industrial will charge a service fee for the provision and mobilization of electrical generators and lighting equipment. In the event Blackrock Industrial mobilizes crews to a project site to find that the customer is not prepared to start work and / or receive our crews for project commencement, a mobilization fee of 5% of the project’s total cost will be charged to the customer. Please note that any installation delays or product damages that result from faulty construction (leaking roofs, plumbing leaks, etc. ), natural and environmental exposure (rain, flooding, bugs, rodents, animals, etc. ), or other generally accepted Acts of God outside the control of Blackrock Industrial shall not be the responsibility of Blackrock Industrial. Additional work and expense to remedy these uncontrollable circumstances will be billed to the customer on a Time & Materials basis and work will be temporarily stopped until those expenses are agreed upon. Pease note that resinous flooring systems take between 4 and 12 hours to cure. Any debris that settles into the product during its curing period will not be the responsibility of Blacrock Industrial. All available means necessary to prevent access or contamination of the product will be accomplished and coordinated by Blackrock Industrial and our clients. Seamless flooring systems are a specialty product that requires attention to detail and swift action. Please note that Blackrock Industrial anticipates the possibility of minor imperfections and/or roller markings accounting up to 3% of the total square footage of the project’s space. It is the customer’s responsibility to remove all furniture and miscellaneous items from the space prior to the project’s commencement. Any items, which may be sensitive to the exposure of concrete dust, should be wrapped or protected by the customer prior to the project’s commencement in order to prevent potential damages. Additional charges will be incurred if Blackrock is asked to protect equipment and / or belongings on the customer’s behalf. It will be the customer’s responsibility to protect or plug any water or waste drains prior to our crew’s arrival so as to prevent concrete dust or product from entering, damaging or warping the drains or plumbing fixtures. Any product entrance or contamination of unprotected drain fittings shall not be the responsibility of Blackrock Industrial Group. 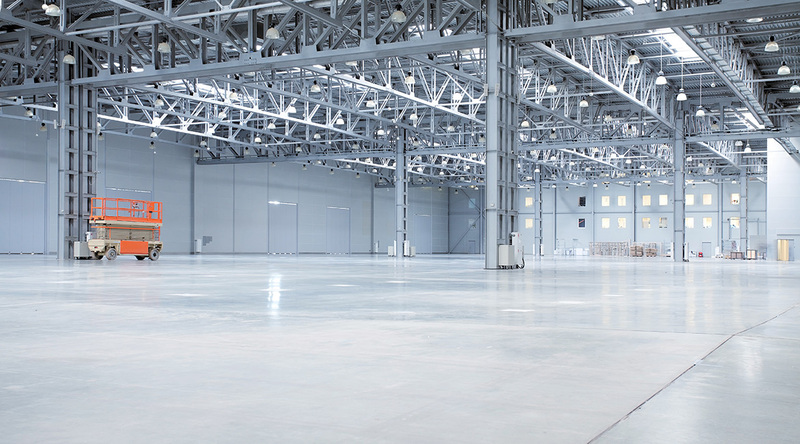 In the event Blackrock Industrial is contracted to remove existing flooring prior to the installation of our products, additional assessment of the sub-floor will be required after the removal to discuss any unanticipated or additionally required work. All expansion and control joints will be honored in the application of new products, unless otherwise specified in architectural drawings, arrangements, agreements, and / or scopes. Any additional work requested by the customer that resides outside of the initial Statement-of-Work will be billed at a Time & Material basis. Work will be temporarily halted until the customer has approved the Time & Material Change Order. Completion Payment Terms are “Due Upon Completion” unless otherwise specified by a Master Contract. Invoices over 14 days past due will be subject to a finance charge of 1.5% per month on the unpaid balance from the issuance date of the completion invoice. It is in Blackrock’s best interest to submit a Statement-of-Work to our customers that encompass all estimated costs associated with their project. In order to clarify any unanticipated situations that can cost time and money for both Blackrock and our customer, we have created these Terms and Conditions to help address how these situations shall be handled. Please see the checklist on the next page we have designed to help our customers better prepare for their upcoming project. Completing the checklist will help to avoid any unanticipated or unexpected charges during your project.